"He kind of looked at us like, 'Oh, OK. This is what was in Mommy’s belly — got it. I’ll keep him safe.'" 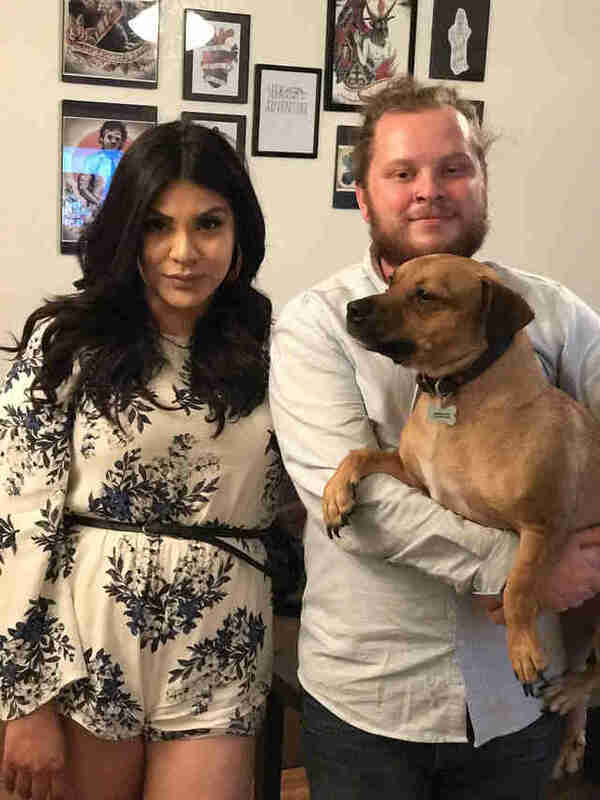 Little is known for certain about Astro the dog’s upbringing, but there’s no doubt about one thing — he absolutely loves his adoptive parents, Corey Jordan and his fiancée Elsa. Since adopting him a few years back, Astro has always insisted on sleeping nestled between them in bed. Corey and Elsa call that his “spot” — but recently, Astro had a change of heart. This week, Corey and Elsa are celebrating the birth of their first child, a son named Noah. But it seems the proud new parents weren't the only ones eagerly anticipating the baby's happy arrival. 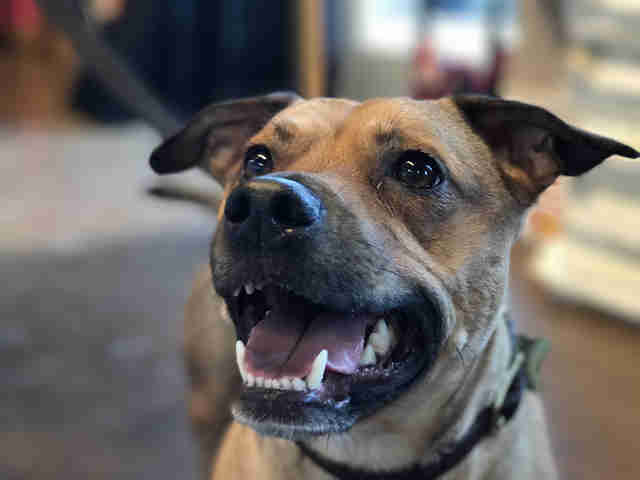 "Astro is a sweet boy and very loving," Corey told The Dodo. "During the pregnancy, he was always near Elsa and would be very protective of her stomach if people were over. He never leaves her side. He’d occasionally lay his head on her belly or put his paw on it and just hang out." The couple wasn't sure how much Astro actually understood of what was going on, or how he would react when Noah finally entered the world. 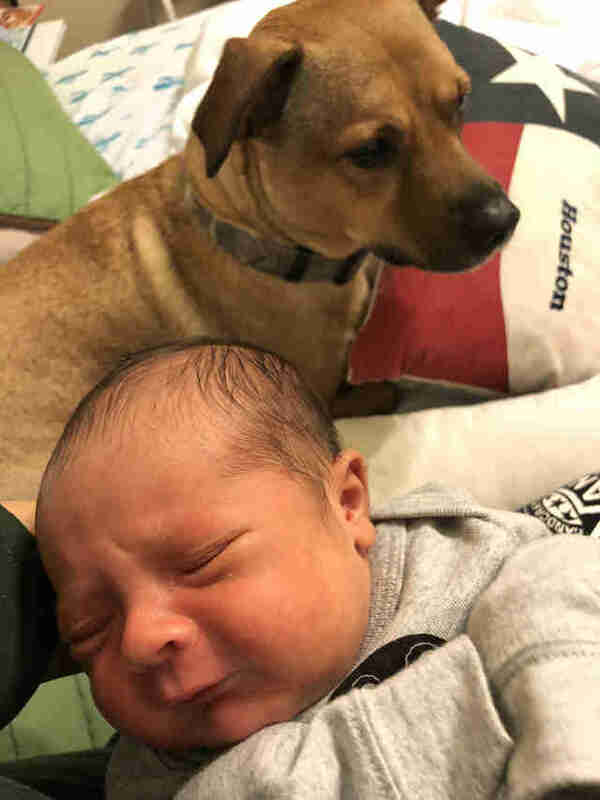 Initially, upon bringing Noah home, the pup was a little perplexed by the chubby-cheeked infant. Eventually, though, he put two and two together. "Astro sniffed Noah all over and then ran to his mommy," Corey said. "He sniffed her and got some pats, but then seemed confused. He went back to Noah and sniffed him again. Then he kind of looked at us like, 'Oh, OK. This is what was in Mommy’s belly — got it. I’ll keep him safe.'" The dog didn't say that aloud, of course, but he meant it nevertheless. 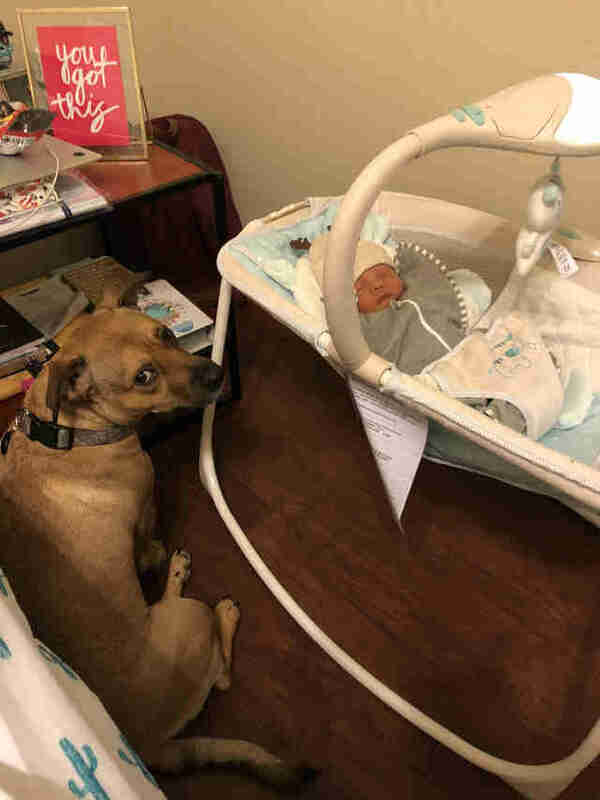 Soon it became clear that, after years of snuggling between Corey and Elsa, Astro had discovered a place he likes even more — by little Noah's side. Since then, that's where the faithful dog passes the night, a change of behavior that came as quite a pleasant shock to his parents. "To see Astro give up his spot, for any amount of time at night, is surprising because he has always slept there," Corey said. "Once he did it, though, I understood. Because he sat there and stared at Noah, and then he laid down. So we both knew what was going on in his head. I think he has found his new spot." 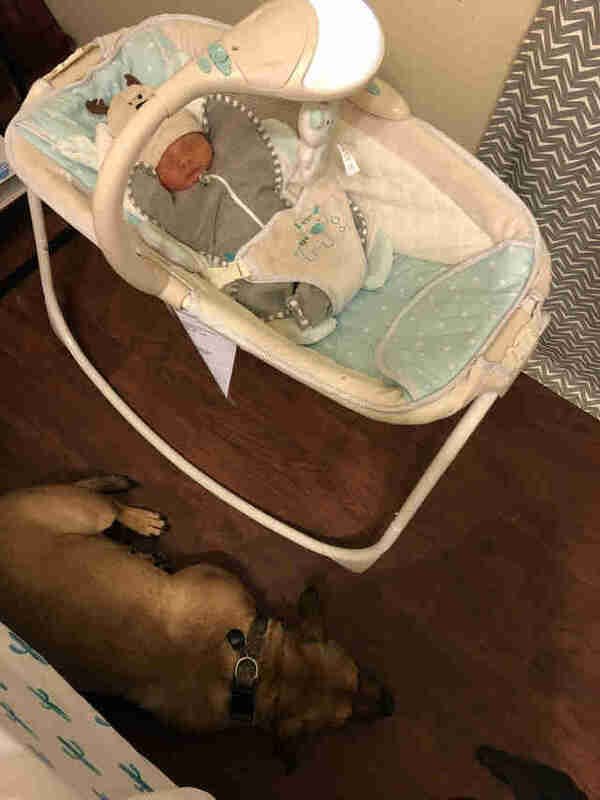 Being a newborn, Noah is obviously never out of reach or sight of his doting parents, but Astro still insists on supervising as they adjust to their new routines. "He’s very concerned about Noah. By that I mean if we get up with Noah at night, Astro is up. When we change Noah at night, Astro just sits at our feet looking up making sure we’re doing it right," Corey said with a laugh. "When we feed Noah on the couch, Astro hops up there and lays next to Noah’s head while he’s eating." As Corey and Elsa continue to learn the ins and outs of parenthood firsthand, the future is looking bright for the young family knowing that Noah already has such a faithful friend in Astro. 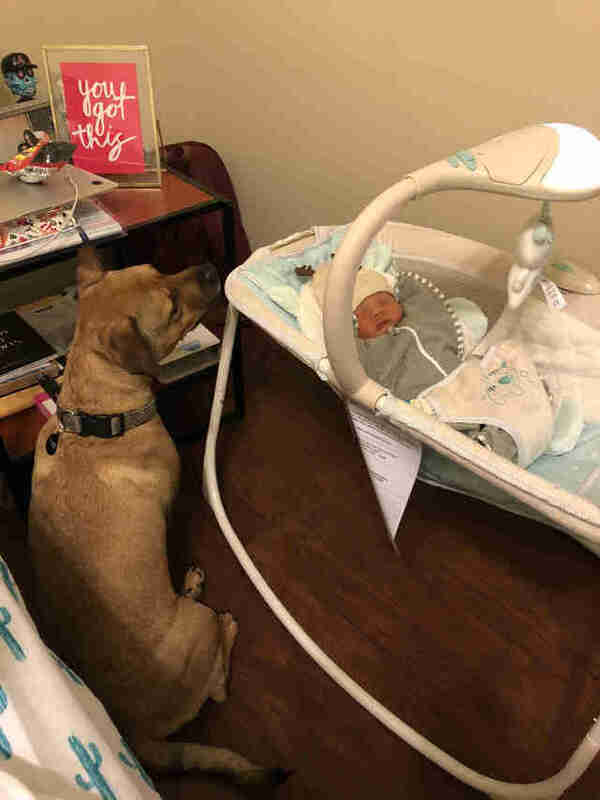 "I think he’ll be a great brother. Astro is very patient and loving," Corey said. "As far as their bond goes, I can see it becoming better and better as Noah gets older and starts to understand things. He’s going to love his big brother." You can keep up with Astro and his family by following them on Instagram.